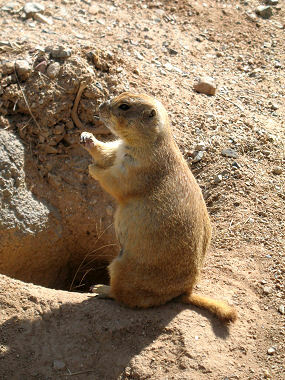 Prairie Dogs are members of the Squirrel Family. They are stout, burrowing rodents with round heads, hairy tails and short legs. They weigh 1.5 to 3 lbs and grow to be between 12 and 16 inches long, including the short tail. Their coats are yellowish in color, with darker ears and a pale buff to whitish belly. In the US, they are found in grassland areas, primarily in states west of the Mississippi. Prairie dogs get their name from their habitat and warning call, which sounds similar to a dog's bark. Studies suggest that prairie dogs use a sophisticated system of vocal communication to describe specific predators. Prairie Dogs live in large colonies or "towns" consisting of a network of underground burrows. Collections of prairie dog families can span hundreds of acres. Families usually consist of 1 male and 2 to 4 females. They are almost exclusively vegetarians and eat a variety of grasses, roots, weeds, forbs and blossoms, acquiring all of their water from the food they eat. Females give birth to a litter each year in the spring. There are usually 3 to 5 youngsters in a litter, but sometimes as many as 8. Common predators of the Prairie Dog include coyotes, bobcats, eagles, hawks, badgers and weasels, however, humans have had the most impact on populations. Prairie dogs are frequently exterminated from ranchland, being labeled as a pest because they are capable of damaging crops.